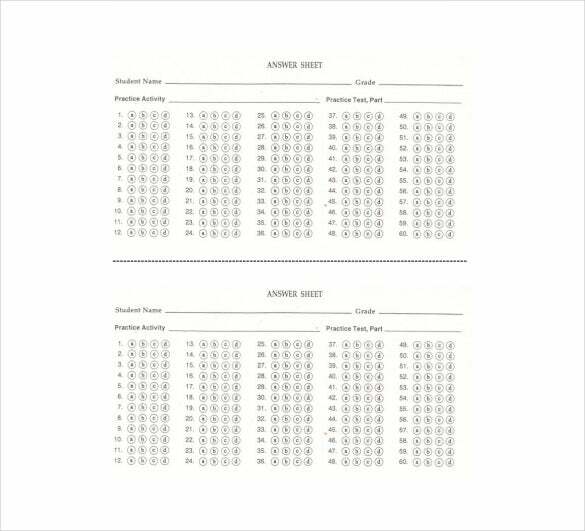 Answer sheets are used for competitive exams, where the candidates have to fill them up as per a separate question paper provided to them. 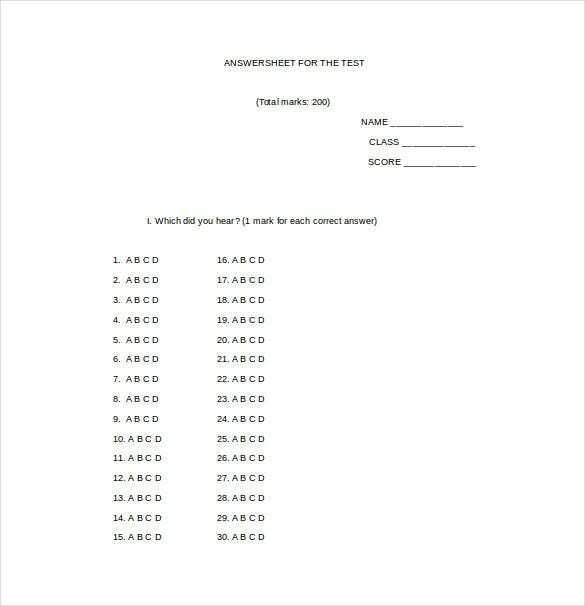 Answer sheets can also be used to run a survey or for evaluating something. 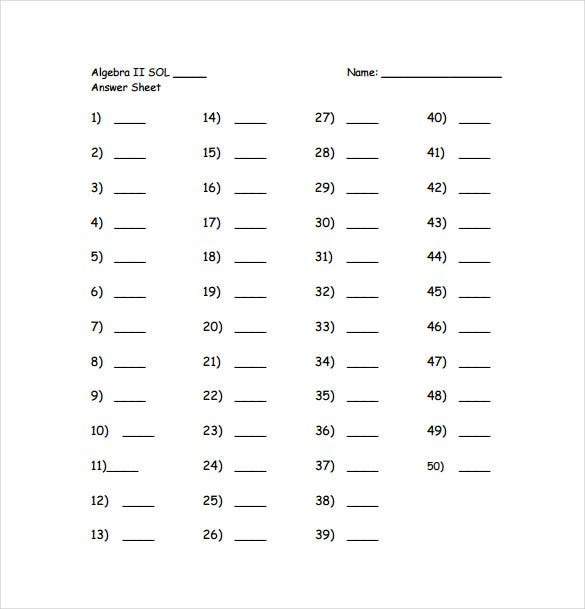 Answer sheet template, available with us can be downloaded in different formats, which include Word, Excel and even PDF. 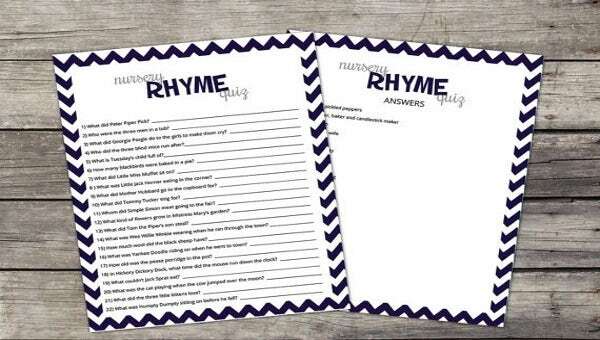 These templates are printable and thus can be used as a soft copy or can be printed into hard copies as well. You may like Cover Sheet Templates. 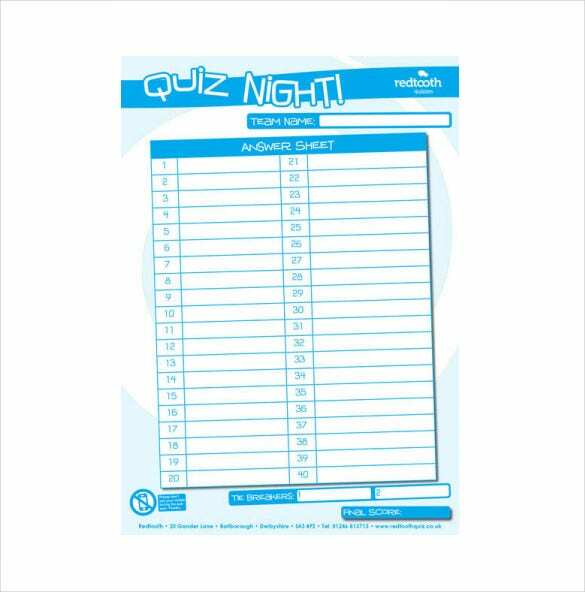 Answer sheet template also help reduce a lot of hassle in developing a new one. A template can act as a sample, which can be customized accordingly. You may also like Sample Sheet Templates. 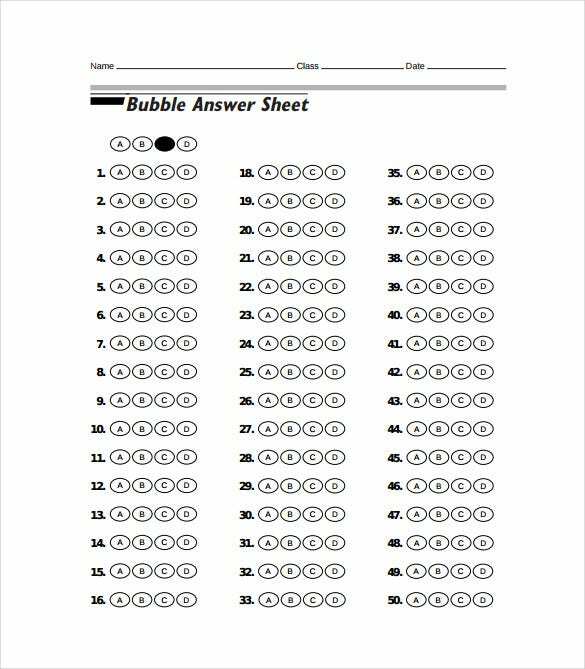 Bubble answer sheet samples are a great utility and comes handy for evaluating multiple choice questions. They can also be scanned and checked through the system itself by proper software. 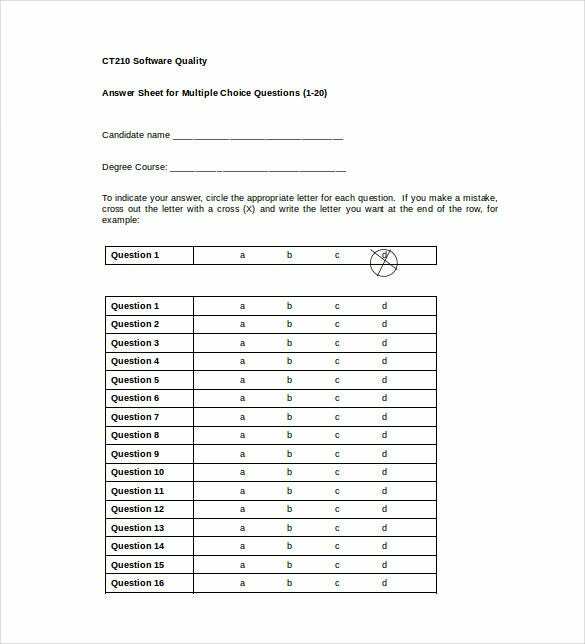 There is no need of drafting a new bubble answer sheet every time, instead one can download the fantastic templates through the link given below. You may also see Printable Sheet Templates. Sometimes it is necessary to evaluate quiz answers to prepares scores for the participating teams. If you are one of the organizers then the samples can be of real help. Here you can record the scores for each and every round and there are no hassles. The format is compact, unique and easy to understand. You may also check out here Fact Sheet Templates. Hearing tests are done for various purposes that include testing for hearing response, testing for observing medical conditions etc. The answers are generally alphabets that the test taker has to mark on his sheet. Such formats are available over the net for free and can be downloaded from the link given below. You may also see Timesheet Templates in PDF. Evaluation and tests are regularly carried out in universities and educational institutions. Sometimes, students too practice mock tests before appearing the main examination. The answer sheet samples are very useful for them. They are nicely drafted and has wonderful formats. Thus evaluation is convenient. The most interesting fact about the samples are that they are available for free over the net. Hence there is no need to buy blank answer booklets every time. You may also see Sheet Templates in Word. Clinical reports too, that are arrived from the response of the patient can be drafted on these ‘easy to understand’ useful samples. 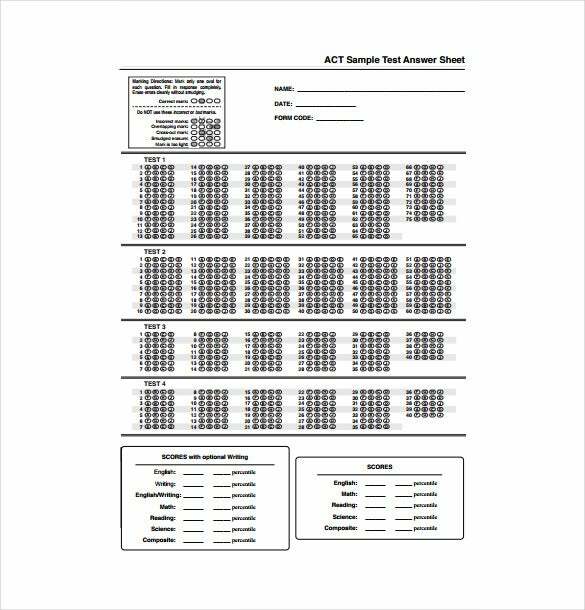 Who can use Sample Answer Sheets? Universities, schools, colleges, students and even clinics can use these samples. Recording the response is easy and one can also evaluate successfully with these samples. As they are available in soft copies, they can be printed and scanned conveniently. Evaluation can also be done through software. Examiners are highly relieved from the burden of checking a chunk of answer sheets and the evaluation process too gets mobilized significantly.There are wonderful samples on which students can highly rely on for their mock tests as well.Tests such as hearing response test and other clinical tests can be drafted on the samples. You may also see Raffle Sheet Templates. 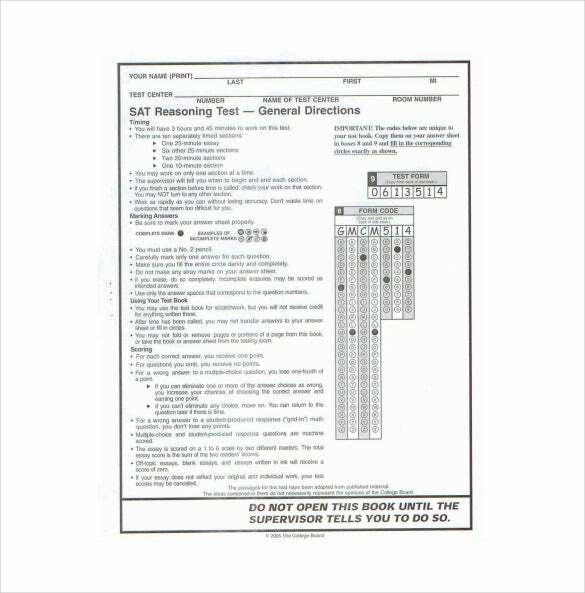 Answer sheet samples are highly beneficial as they save time and money both. 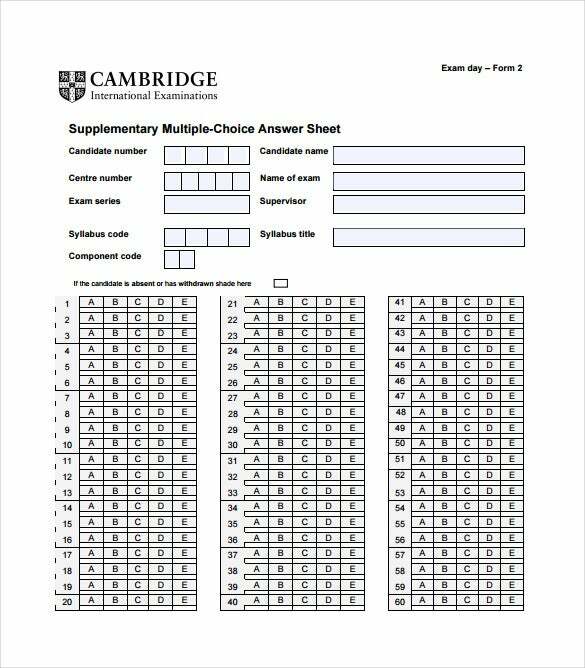 Since answer sheets are required more often in universities and educational institutions, such samples are always a benefactor for them. Every time they need not rely on third party to prepare their answer sheet and incur expenses. Instead, downloading such samples, printing them and providing them to the students is always a better option. Students too, can do away with buying blank workbooks for their exam preparation from time to time. Numerous mock tests can be written through these samples and they are available for free. You may also see Sheet Templates in PDF. 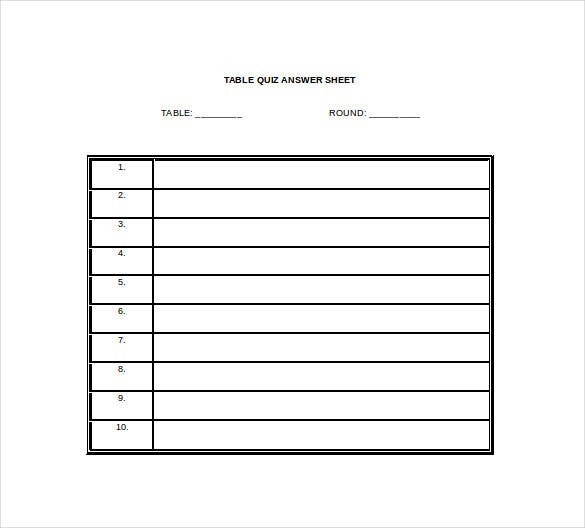 Valuable time and money, both, can be saved by using the free answer sheet templates available on the net. As a student one can be benefited significantly and for the universities they are simply indispensable. So, give a click to the link and download the samples today! 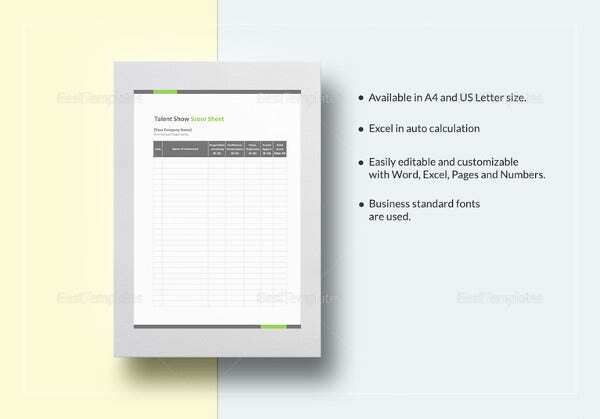 You may also check out here Free Sheet Templates.